3 Bedroom Semi Detached House For Sale in Darlington for Asking Price £250,000. 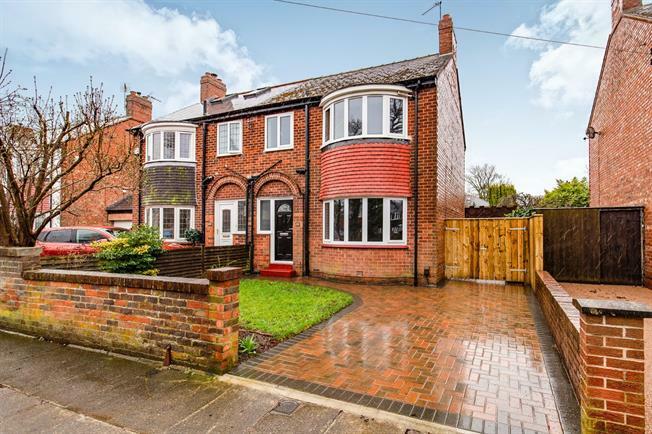 Completely refurbished, and recently extended family home. Immaculately presented throughout, this property has been finished to a high standard with quality fixtures and fittings throughout. Improvements to the property include; a fully integrated kitchen with appliances, multi-fuel stove in lounge and brand new contemporary bathroom suite. The garage has been converted into a utility room with plumbing, as well as leaving room for storage to the front. Extensive tiered garden to rear with off street parking to front. Laid with wood flooring, understairs storage and doors leading to all ground floor rooms. Composite front door, PVC window and central heating radiator. Situated just off the entrance hallway and fitted with a low level WC and wash hand basin, laid with wood flooring and central heating radiator. Bright and airy lounge with bay window to front and patio doors to rear. Feature inglenook fireplace fitted with a log burning stove with granite hearth. Fitted with brand new carpets, recessed spot lights and central heating radiators. Brand new kitchen fitted with white high gloss wall and base units with contrasting solid work surfaces over. Equipped with integrated appliances including; ceramic hob, electric fan oven and extractor hood, fridge freezer, dishwasher. Fitted with recessed spotlights, under counter lighting and kick-board heater. Tiled splash-backs and wood flooring with patio doors allowing access to the rear garden. On kitchen, laid with wood flooring, fitted with recessed spotlights and central heating radiator. With loft access and small storage cupboard. Spacious room fitted with brand new carpets, recessed spot lights, central heating radiator and feature bay window to front. PVC window to rear overlooking the rear garden, central heating radiator, recessed spot lights and brand new carpets. PVC window to rear, central heating radiator and fitted with brand new carpets. Recently fitted contemporary bathroom suite, with part-tiled walls and laminate flooring. Fitted with a P shaped bath and shower over with fixed shower screen, pedestal wash hand basin and low level WC. PVC window to front and chrome heated towel rail. Half garage conversion into a utility room, including plumbing for a washing machine and space for tumble drier with work surfaces over. Half garage suitable for storage.